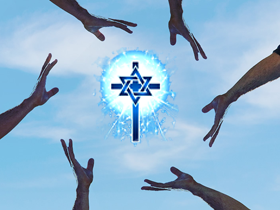 Focusing on what Unites Jews and Evangelicals! For as long as Jews and Christians have existed, there has been an obvious tension between both groups too often resulting in the ostracizing, force conversions, expulsions and deaths. Both sides have become very good at itemizing what divides them and dwelling on the differences. Over the years, finger pointing and blame shifting has almost become an art form in Judeo/Christian relations. To be perfectly honest, I regularly find myself on the forefront of a constant battle to defend Israel and the Jewish people, and I do my own share of finger pointing. Don’t get me wrong, I still believe that there is much to be learned about Christian anti-Semitism through the ages, and even today if we want to successfully defeat the beast. But I often wish that we could focus on what unites evangelicals and Jews more that what divides us. On April 1st (no joke here!) a dialogue between Rabbi Shlomo Riskin, Chancellor of Ohr Torah Stone and Joel C. Rosenberg, New York Times bestselling author, took place at an orthodox Jewish synagogue in New York. The theme for the evening was “Are We Still Alone?” and was based onRosenberg new novel The Auschwitz Escape. I resonate with Rosenberg who after visiting Auschwitz in 2011 and reading a book on the few who escaped the death camp, wanted to write a book about those who helped the Jews. That process led him to discover the incredible story of the small French village of Le Chambon sur/Lignon and how all the villagers went out of their ways to save Jewish people from the Nazi furnace. They risked their own lives and many even lost their lives as they were also taken to the camps with Jewish people. But to the villagers, saving the Jews was “the most natural thing to do!” like this elderly woman says in the book by Philip Hallié about le Chambon titled “Lest Innocent Blood be Shed”. I haven’t yet read The Auschwitz Escape but I can tell you that we can learn a few things from the dialogue that just took place in New York. While I tend to side with Joel Rosenberg theologically, I am also very aware that as a Jew I am a constant target for many different people today. Yet, some of them have never met a Jew in person. The fear expressed by Rosenberg and Rabbi Riskin, is that a second Holocaust would take place today, especially if or when Iran finishes building the bomb. It is a real fear because Iran wants the eradication of Israel more than anything. Even though President Rouhani sugarcoats his anti-Semitism to the West, his goal is the total annihilation of Israel. Disagree with him all you want (and I do), but at least Ahmadinejad was very clear about his desire to destroy Israel. So the question remains: Will there be Christians to stand for Israel? Rosenberg made an excellent point when he defined who was an evangelical Christian based on what the Bible has to say. It can be very easy to succumb to some sort of corporate character assassination and put all Christians who didn’t help Jews in the same shameful category. I can even justify it by quoting passages like Psalm 83. If a Christian is defined by a commitment to follow Yeshua’s teaching based on the Bible, then the boundaries are clear. Christians are forgiven not perfected (at least not yet). Christians can and will make mistakes, wrong judgments and even biased decisions. Yet, in Leviticus 19:18 we read: “You shall not take vengeance, nor bear any grudge against the sons of your people, but you shall love your neighbor as yourself; I am the Lord”. It is then repeated by Yeshua in Matthew 5:43-44 and even taken one step further: “You have heard that it was said, ‘ You shall love your neighbor and hate your enemy. ’ But I say to you, love your enemies and pray for those who persecute you”. Have Christians fallen short over the centuries? Yes! Are some giving a bad rep to the rest of the Christian community? Yes! Should we then paint with broad strokes? NO! On one hand, Rosenberg claimed that while some Christians might have made mistakes about the Jews and even some that lead to the death of some, this cannot disqualify them as born-again Evangelicals, and as much as I dislike the divide and its tragic results, I must agree. On the other hand, I also agree with Rosenberg who stated that if you are characterized by a chronic hatred leading to a constant desire to destroy the Jews or any other human being for that matter, you are not a genuine Bible believing follower of the Jewish Messiah. One of the most important aspects of true Christianity is the ability to love unconditionally. Christians who love Jews–and they still exist–ought to love them regardless of their ability or willingness to embrace Yeshua and His teaching. Anything short of that kind of love falls short of what Christian love is. Period! Rabbi Riskin obviously didn’t share Rosenberg’s belief in Yeshua of Nazareth being the Messiah but recognized the common obligation of biblical Jews and Christians. Followers of the one true God must be driven not only by their convictions but also by a constant desire for human decency and justice. Rabbi Riskin and Joel Rosenberg see the need for Jews and Christian Zionist (a disappearing breed) to unite, and I join them in their honorable effort. Christians failed the test of unconditional love in the 1930’s and 40s. The day might be coming when there will be a retake. Will they fail again? I pray that they don’t. Christians and Jews are UNITED by the Jewish Scriptures! Christians and Jews should be UNITED by their love for Israel! Christians and Jews can be UNITED by Yeshua the Jewish Messiah! My Review of Noah – which I have not seen!